BOATERexam.com® is a leading provider of safe boater education and certification across the United States and Canada. Our online boat safety course and exam allows boaters to meet mandatory education requirements and to obtain their official boater education card or boating license online. BOATERexam.com® has certified over 1 million boaters and counting during the past 11 years! We will guide you through the exam study and preparation process with easy-to-understand explanations and instructions, including colourful illustrations and animations. We will help you prepare for your boat license exam so that you can get onto the water and boat safe. BOATERexam.com® offers boating safety courses approved by the National Association of State Boating Law Administrators (NASBLA) and recognized by the U.S. Coast Guard, and each of our state-endorsed boating exam courses has been approved by the state agency responsible for boating safety. Since boat license laws and requirements vary from state to state, each course is custom tailored to meet state-specific education requirements. Registration is free and simple. Get started and on your way to becoming a safe and smart boater! • Get Your Boating License! 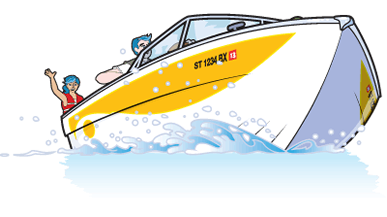 BOATERexam.com® offers a Transport Canada approved boat licence course and exam for the Pleasure Craft Operator Card, required by Canadians operating powered pleasure boats in all provinces. By signing up to BOATERexam.com® to get your Canadian boating licence, you get access to our comprehensive and easy-to-understand study guide, complete with illustrations, animated videos and audio. BOATERexam.com® is the largest issuer of the PCOC in Canada, offering the most convenient way to get your Canadian boat licence. You can study and take your boating exam completely online, print out a Temporary Card to get on the water right away, and become certified for life! • Get Your Pleasure Craft Operator Card!